For all intents and purposes, Earth only has one natural satellite, namely the Moon. But that still leaves room for Trojan asteroids, objects stuck in the same orbital resonance, and even tiny asteroids that really do temporarily orbit our planet. "It's the Rosetta stone of the solar system. You bring back a chunk of material that's never been processed through the atmosphere, that's not been sitting on the ground. It's going to be a tremendous wealth of information about how the solar system formed — even more so if you can bring back more than one and get different types of material. The great thing is you don't have to go very far. These things are sitting there right in geocentric orbit and they're relatively easy to get to." Of course, even with these new telescopes, finding such tiny asteroids in such a relatively large region of space would be an incredibly challenging task. In particular, if we actually want to send spacecraft to these temporary moons, we would probably need to locate them almost as soon as they enter Earth's orbit, just so we have enough time to reach them before they resume their wanderings through the solar system. For more on the potential benefits and challenges of this idea, check out Discovery News. 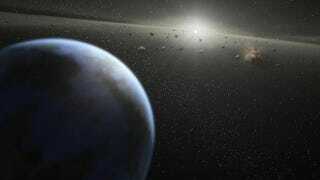 Artist's conception of Earth-like planet and surrounding asteroids by NASA/JPL-Caltech.